Greg Philo, the research director of Glasgow University’s Media Unit, argues, along with others, that we in Britain do not need to cut government spending because we are a rich country. Our total personal wealth is £9,000 billion. Yet we’re in debt. His solution (in the Guardian on 16 August 2010) is that we only need a one-off wealth tax of 20 percent on the richest half to pay off the national debt. Click on a chart or image for easier viewing. This completely misses the point. The government raises £520 billion in total taxation and spends £660 billion. Left to continue, the national debt will grow by more than 50 percent in 5 years (see table 1). The problem is not the national debt per sebut the fact that the government is spending 30 percent more than it is raising in taxes. Present value corrects the debt for future inflation and allows comparisons between the years. Table 1 – Carrying on as we are! Even if we did pay off the national debt we would still have to stop spending more than we are raising in taxes. This is presented as a choice between cutting spending or increasing taxes or a combination of the two. Either way it is a reduction in spending. If the government takes more in tax, we, the public, spend correspondingly less. The question is ”Who is best placed to spend our money – we ourselves or the government?” Often it is the government. Few want a private police force and the vast majority supports universal education, good health care and so on. However, the last government demonstrated an extraordinary ability to overspend and ruin the economy whilst, at the same time, billing itself as a safe pair of hands. Gordon Brown promised us an end to boom and bust. He kept his promise by ending boom with the biggest bust of my lifetime. Experience shows that we can’t trust governments to spend money wisely. The argument continues that if government cuts its own spending there will be a huge increase in unemployment, welfare costs will go up. It is a vicious circle. This is true – we are in a mess. Unfortunately, if we increase taxation we cut private spending and unemployment also goes up. Neither increased taxation nor reduced government spending avoids increased unemployment. The current government is not proposing to stop the overspend, merely to cut the excess in half by cutting state excess. This is accompanied by a lot of rhetoric. The last government created many new Quangos and this is subject to a much vaunted proposal for a popular reform by the coalition government. I don’t know how much we spend on Quangos but I doubt if a Quango cull will make much of an impact on the problem. For many Tories, defence is a sacred cow but it is an obvious target for saving. Referring to table 2, below, the UK spends considerably more for defence than the Netherlands, even on a per capita basis. This finances expeditions into Afghanistan and Iraq and, arguably, makes Britain a target for terrorism. Living in the Netherlands and being less of a target for terrorism, despite the lower defence spending I feel safer than I would living in the UK. It is not a given that high defence spending ensures a higher level of security. Tories would argue that the world is safer and that the UK has influence over the US which other countries do not have. I find this unconvincing. I do accept that we need to be able to defend our own people such as in the Falklands against a pretty horrid dictator but that does not have to cost as much as it currently does. Table 2 – Defence spending in various countries. If halving defence spending is our target, because of contracts and firm commitments it has to be done gradually. Table 3 – Effect of halving defence spending. It is obvious that we are in a hole. Cutting defence spending will not work quickly enough, nor will it do the entire job. Similarly cuts in Education and Health Care would have to be phased in gradually..
Table 4 – Government spending by department. Looking at the numbers in table 4 we see just how big Welfare, Health and Pensions are. The coalition government promised to ring fence health expenditure but now talks about front line services only. You can see why. One day soon we need to save or tax an extra £150 billion and money like this just does not grow on Quangos. Pensions and welfare are the easiest of the difficult targets because cuts here can take immediate effect. The last government argued and continues to argue in opposition that the solution lies in stimulating growth. They attempted this by Quantitative Easing. The Bank of England bought bonds from the market in the hope of increasing the money supply, thereby stimulating lending and fuelling growth. In short, the bank printed money and wrapped it up in Latin (ex nihilo – or out of nothing). We do not have to be geniuses to see that this is fundamentally inflationary, but as I shall argue, this is what any government would want. Between March 2009 and March 2010 the Bank of England pumped £200bn into the economy in this way. The stated aim was to encourage bank lending. According to the Bank of England’s figures there has not been a visible effect (table 5 and figure 1), although some argue that things would have been worse without it. It is hard to imagine that it would have no effect at all. Table 5 – Lending to UK businesses. 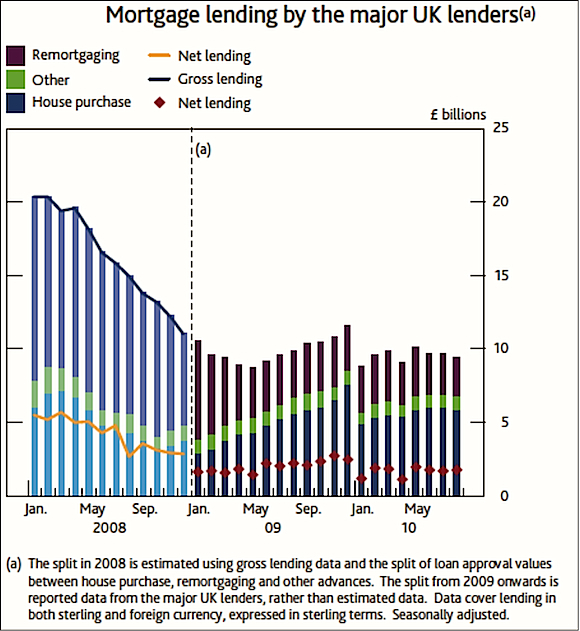 Figure 1 – Mortgage lending (Source Bank of England: Trends in lending Sept 2010). From the government’s point of view, one of the beauties of Quantitative Easing is that it does not appear on the National Debt. The money spent on bonds is set off against the bonds themselves. It does not alter the fact that the government printed money to buy them and it does increase inflation and this is exactly what we have been given. 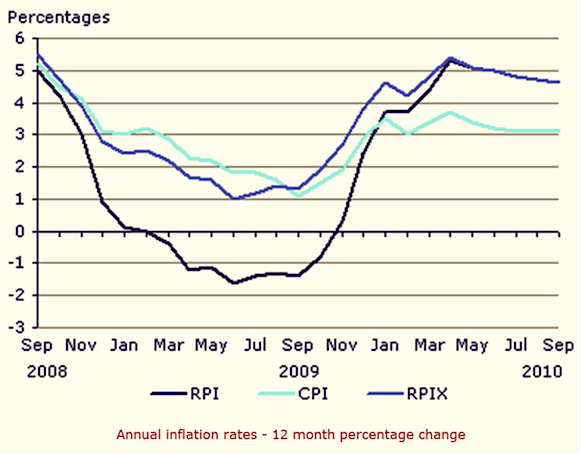 Figure 2 – Inflation UK (Source National Statistics On-line). There is one way of balancing the books. It is the elephant in the room. Nobody talks about it. It is the old method – inflation. Of course, agreements within the European Union forbid this but there is not much alternative. With inflation governments reduce the value of their debts at the expense of the saver. It transfers wealth from the prudent to the profligate and gets the government out of jail. They will blame it on the banks, bank bonuses, climate change and the oil companies, but since all European countries are in the same sort of mess you can bet your bottom dollar/pound/euro that inflation is what we will get. Table 6 – The inflationary cure. Another great attraction of inflation is that it lowers the value of the currency, improves our export performance and mitigates unemployment. The important figure with inflation is the present value of the debt. I am not arguing that 13 percent inflation (table 6) will be inflicted on us but it is important to understand that 13 percent inflation alone holds the debt at its present value. We can expect the government to try to operate on taxation, spending, and on inflation, as illustrated in table 7. Table 7 – A combined cure. We are in for pain and pain includes increased inflation. We should understand Quantitative Easing in this light. Nick O’Hear is chairman of Tension Technology International, Ltd. This Fortnightly Review article is filed under the following rubrics: Chronicle & Notices, Economics and Finance. Publication: Saturday, 30 October 2010, at 23:15. Options: Archive for Nick O'Hear. Bookmark the permalink. Follow comments here with the RSS feed. Post a comment or leave a trackback.